Before considering how it was that, after the Resurrection, our Savior appeared to his disciples under various forms and likenesses, it will be profitable to contemplate why the Lord appeared in varying manners. On this point, St. Thomas Aquinas offers a remarkable insight which comes from several of the early Fathers. To those who were properly disposed to the truth of the Resurrection by the virtue of faith, Christ allowed himself to be seen in his proper figure; but to those who were not yet so disposed, he rather disguised himself under another form. Hence, St. Mary Magdalene did not at first recognize her Savior, until he moved her to faith. Likewise, these two on the way knew the Lord only in the breaking of the bread – which signifies the sacrament of faith. The physical vision granted to the disciples corresponds to the spiritual vision of their hearts. And yet, immediately upon being recognized by Cleopas and his companion, Jesus vanished from their sight. Are we to suppose that he teleported away from that place – literally falling out of existence from one place in order to come into existence in another place, without crossing the intermediary length of space? So long as the resurrected and glorified body remains a body (and surely it must), it will be physical. While the Resurrection perfected and elevated the body of Christ, it did not essentially change it – the saints will be raised immortal and incorruptible, but not immaterial. The glorified body, by the gift of agility, will move extremely fast – but it will not teleport. 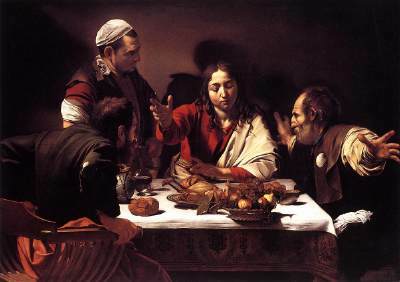 Therefore, as it is simply and absolutely impossible (on the level of a logical impossibility) for a body to pass from one point to another without crossing the intervening space; it is not possible that the Lord should have teleported away from the disciples at the meal on the road to Emmaus. Jesus did not teleport, he vanished – this implies a change in the vision of the disciples (and in the manner in which Christ was manifested to them) more than a change in the location of the Lord. Though the resurrected body of Jesus must necessarily be physical and, therefore must be extended in space, it need not always be seen. Indeed, it often occurs that, while the quantity and size of an object remains the same, that object is seen under different aspects according both to the properties of the eye which looks and according to the circumstances of the environment. A change in manifestation need not always imply a change in essence or quantity. In the case of the glorified body of Christ (as well as that which will be given to the saints), though the quantity of the body does not and cannot change, the visible manifestation of the body is capable of being changed according to the will. Hence, when Jesus desired to be seen, he was seen; and, when he desired no longer to be seen, he was not seen. And this, without any essential change in the body itself – which remains ever physical and material, though glorified. Could His glorified body have been a hologram? - a 3-dimensional image formed by the interference of light beams from a laser or other coherent light source). According to Scientific American, 2003, quantum physics says the entire universe might be! It's fascinating. This is too much for my pea brain, but I do have a question about Cleopas. I read somewhere that he was the brother of St. Joseph. Is this true? I am not aware of any such tradition ... however, there is much mystery about Cleopas. First, we should note that it is most likely that the Cleopas on the road to Emmaus and the Cleopas whose wife was named Mary (the same who stood at the foot of the cross) are almost certainly two different people --- in Greek, the names are written differently. This second Cleopas may be Alphaeus (which may be the Aramaic name for the greek Klopas), who is the father of James. This James is sometimes identified with James the lesser who is called the "Brother of the Lord", as being his cousin. So ... if the Cleopas who was the wife of Mary is also father of James the lesser who is the cousin of Jesus; then it would be possible that Cleopas may have been related to St. Joseph. Thank you, Father, for clearing it up. This is what I read - Cleopas was the husband of Mary Cleopas (and the brother of St. Joseph) and they were the parents of Mary Salome (who was married to a scoundrel). St. Jude Thaddeus, St. John, St. James and St. James the Lesser were their children (I don't recall now who belonged to who). It was only this year that I also read that one of the men on the road to Emmaus was Cleophas but I didn't know they weren't one and the same. So much for us to find out when we (God willing!) get to Heaven!! "This Cleopas was the brother of S. Joseph (the husband of the Blessed Virgin), the father of S. James the less, and S. Jude, the grandfather of S. James the greater and S. John, who were the sons of Salome, the daughter of Cleopas." Thank you, Father. If we ever have money again, I intend to invest in Fr. Cornelius a' Lapide's Commentaries. Tomorrow, I will be posting an article which I think you will really like ... it is all about Cleopas and was inspired by your earlier comment! when the bread was broken, he then vanished from their sight - could His physical body been then mysteriously incorporated into the bread? Connected to His thrue presence in the Eucharist?